You and your horses (or alpacas, sheep and other gentle creatures) will fall in love with this 17.5 acre country setting near Honor. 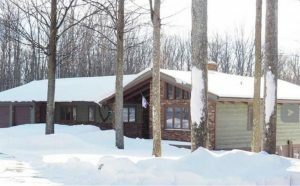 Spacious northern MI home is set back from the road with the feel of the north woods (in mature hardwoods) plus a beautiful meadow / pasture view behind it. Everything you need, including your master suite, is on the main level for easy living, with additional rooms including a family room with wet bar, bedroom, and two den / office rooms with closets in the lower walkout level. Features abound. Vaulted ceiling upstairs adds to the spaciousness. Updated kitchen (granite counters, etc.) is full of light. Get cozy beside the fireplace in dining/living rooms. Appreciate the views and serenity from multiple windows and the outdoor deck. Three garages (one with a workshop area) for the classic car collector and an 80×32 insulated pole building with a 12×40 horse barn / storage area and 14 foot drive-thru doors. Although Chris newly listed five properties (3 residential waterfront, 1 vacant lakefront, 1 residential over $500,000) in the last three weeks, her report from Robert Reamer and Traverse Area Association of REALTORS (below) indicates that inventory is not rising with lightning speed. The last two weeks have seen a 50 percent increase in new listings, while overall numbers remain somewhat low. Residential sales, on the other hand, increased by almost 100 percent from week ending 2/25 to week ending 3/4. Sales by county indicate that Grand Traverse County is (not surprisingly) experiencing twice the number of sales as the county with the next highest unit sales: Wexford. 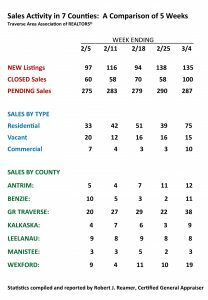 Benzie County averaged six sales per week the last five weeks, and Leelanau County averaged 8-9 sales per week — in all categories. Commercial sales shot up last week, but whether that signifies an upward trend or is an anomaly remains to be seen. Vacant land sales remain low, not unusual for winter weeks. Pending sales are down from this time last year. We shall see what warmer weather brings. Spring begins March 20 — or so sayeth the calendar.